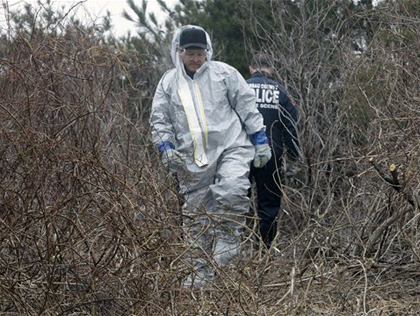 (CBS/AP) WANTAGH, N.Y. - Police are returning to a barrier island off New York's Long Island where 10 sets of human remains have been found in the search for more victims of a possible serial killer. A wildlife sanctuary near Tobay Beach will be searched on Friday. A human skull was found there on April 4. Human bones were also found nearby along Ocean Parkway. Crews have uncovered at least 10 sets of human remains along the coastline in both Nassau and Suffolk Counties, including a skull, the bones of a toddler and the remains of four missing prostitutes. Four sets of remains were found in December. They have all been identified as prostitutes who advertised on Craigslist. Six sets of remains that were more recently found and are being DNA tested in an attempt to identify them. If and when they are identified, investigators will try to locate family members for more information about the victims' backgrounds with the hope that it will lead them to the victims' killer. The first remains were found during an investigation into the disappearance of a New Jersey prostitute last seen in Oak Beach a year ago. She hasn't been found.